Khan el-Khalili Souk is a major market in Cairo, Egypt. Cairo’s Khan El-Khalili Souk is every shopaholic’s dream, it’s open from dawn to dusk, and brimming with undiscovered treasures, spices and much more. Here’s your cheat sheet. Words by Jessica Zavolokin. This souk in El-Gamaleya district is a vibrant, vivacious bazaar on a grand scale. With the atmosphere of a traditional Arab market, it’s riddled with ‘No hassle’ signs and storekeepers playing the “Look for free, mister” card. 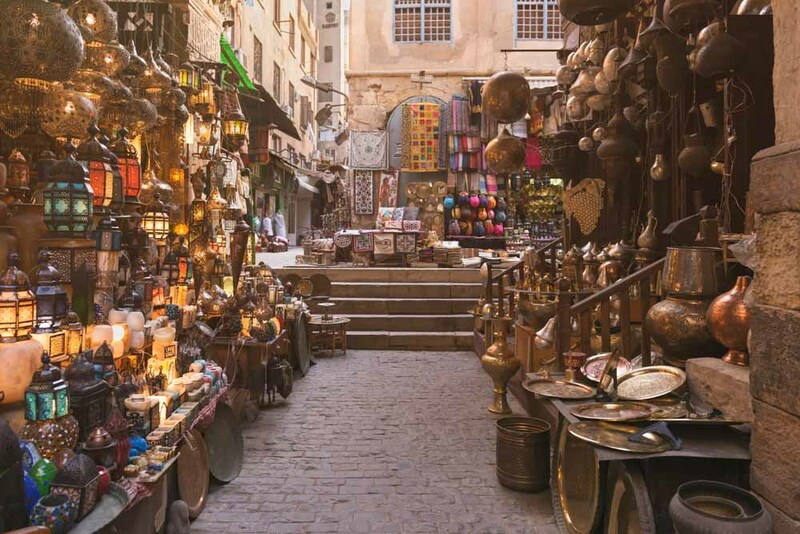 You’ll find all walks of life in Khan el-Khalili, on the look out for something among the seemingly infinite variety of trinkets and treasures on offer. Local merchants have been bartering with customers here since the 14th century, with the Gold District still the most sought after corner of the market. Buzzing from dawn till dusk (excluding Friday morning and Sunday), this medieval-looking mini-mall features a brilliant blend of vendors selling everything from soap powder, semiprecious stones, spices, and perfumes. When your legs can’t take anymore, make your way to the historic El Fishawy, one of the country’s oldest coffeehouses, established in 1773. Not much has changed since its inception, with ornate mashrabiya screens and timeworn chandeliers setting the scene. Order a hibiscus juice or refuel with some Arabic coffee and watch the world go by among locals smoking apricot-flavoured shisha.